Above, DFMCH Chair Valerie Gilchrist, MD (center), poses with STFM Foundation President Deb Taylor, PhD, and STFM President Stephen Wilson, MD, after receiving the 2018 F. Marian Bishop Leadership Award at the STFM Spring Conference. 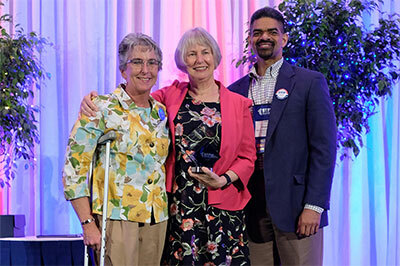 University of Wisconsin Department of Family Medicine and Community Health (DFMCH) Chair Valerie Gilchrist, MD, received the prestigious 2018 F. Marian Bishop Leadership Award at the Society of Teachers of Family Medicine (STFM) Annual Spring Conference, held May 5-9, 2018, in Washington, DC. The award honors individuals who have significantly enhanced the credibility of family medicine through a sustained, long-term commitment to family medicine in academic settings. The STFM said the award was given to Dr. Gilchrist because of her direct professional contributions to the Society and to other organizations relating to family medicine. Dr. Gilchrist has chaired the DFMCH for nearly 11 years, during which time the department became a department of family medicine and community health. She is also the board chair of the Association of Departments of Family Medicine, and has served on the boards of the STFM, the North American Primary Care Research Group and the Ohio, North Carolina and Wisconsin Academies of Family Physicians. Thirty DFMCH faculty, learners and staff also led or presented 18 educational sessions—posters, seminars, workshops, lectures, panels and roundtables—at this year’s conference. Topics included mentorship, inclusion and diversity; health equity; patient panel weighting systems; community partnerships to enhance nutrition and health; physician resiliency and relationship-centered care; and curricular tools to enhance obstetrics and evidence-based medicine skills. Beth Potter, MD, and Kenneth Kushner, PhD, present a poster on the Healthy Embodied Able Leadership (HEAL) program, which is designed to give physicians tools to build resilience and develop leadership skills for the changing healthcare landscape. Next year’s STFM conference will be held April 27-May 1, 2019, in Toronto.